Megan Doldron is a native of the beautiful twin Islands of Trinidad and Tobago. She earned her Bachelor’s degree at Hollins University in Roanoke Virginia with a double major in Biology and Dance and a minor in Psychology. 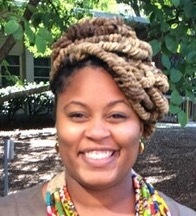 She then earned a Masters in Biology Education at North Carolina A&T State University where she was awarded the North Carolina A&T State University Graduate Fellowship 2014-2015. Megan then taught high school Biology for 3 years at Reidsville High where she was awarded Teacher of the Year in her 2nd year. She then decided to return to school and pursued and earned her Master of Science in Biology at North Carolina A&T State University. Her research focused on natural alternatives such as antioxidant rich plants and how they can reduce the signs of airway inflammation and oxidative stress caused by exposure to dust from swine confinement facility. She is currently enrolled in the Ph.D. program where her research is focused on epigenetic effects cannabinoid exposure in the lungs and whole body system using in vitro mono- and co-culture methods and in vivo animal models. 1) Marlee Vassall, Fall 2017~ : Marlee worked with Megan to learn cannabinoids effects on bronchial epithelial cells in vitro. Currently, she is examining effects of cannabinoid exposure on Medaka germ cells. 2) Bibhuti Timalsina, Spring 2018~: Bibhuti worked with Valerie Fricault to learn about effects of aluminum and cerium nanoparticles on lung alveolar cells in vitro. Currently, she is looking at effects of these two types of nanoparticles on normal bronchial epithelial cells. 3) Arianna Mathewson, Spring 2018~: Arianna started in my lab as a freshmen student. She is learning a variety of cellular and molecular techniques. Her project is to mitigate glyphosate induced developmental defects in medaka. 4) Jayanti Magar, Fall 2018 ~: Jaya is trying to establish medaka primordial germ cell culture method. 5) Alexis Starr, Fall 2018~: Alexis is a honors student. Her thesis is to examine bisphenol A effects on extrahypthalamic kisspeptin neurons in medaka. 6) Deborah Killian, Fall 2018~: Debbie is focusing on immunolocalization of DNA methyltransferase (DNMT) enzymes on medaka testis at various states of development. 7) Phillip Holland, Fall 2018~: Phillip is studying BPA effects on mitochondria of germ cells and sperm in medaka. 8) Amanda Chase, Spring 2019~: Amanda is currently learning basic lab techniques and overseeing fish colony.